It may sound a little odd but it is really rather tasty. There is lots of room for substitution here like chicken for turkey, goat cheese for mozzarella, pretzel bread for French bread, etc. Mmmm....I may have to put that on next week's menu plan. Split bread in half lengthwise. Brush olive oil over both of the cut sides with a pastry brush. Broil in oven until golden then remove from oven. Set aside. In a saucepan, mix turkey, garlic powder, Italian herbs, and a dash of olive oil until heated through. While the mixture is heating, spread pepper jelly over the toasted bread. Once the mixture is hot, start building your panini. 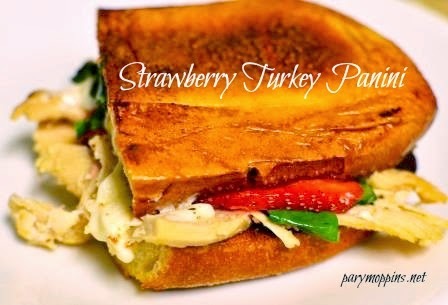 Place the mozzarella on on side of the bread then stack the turkey mixture, spinach, strawberries, basil leaves, and top it off with some freshly ground pepper. Place the other half of the loaf on top. Mash down on the whole thing and cut off a chunk to go in your panini press. There's a wonderful food truck in Dallas that does marvelous angus beef sliders with strawberries. Great combo. Yours sounds great too! Oh I can't wait to try this. So glad you shared it! Oh my God this sounds and looks so delicious! 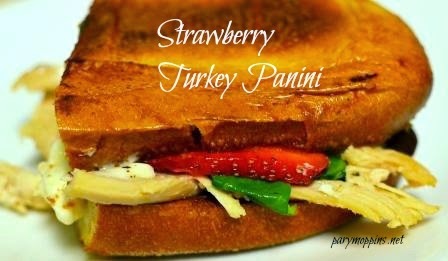 I just love the Turkey and Strawberry combination for your sandwich, yum! Thanks so much for sharing your awesome recipe with Full Plate Thursday and have a great week! And thank you Ms. Helen for stopping by!